Stop at any business with “Carl” the Snail in the window to pick up a map and the Post Gazette insert listing the specials. The map will have all the participating businesses along with any special music events. The Sunday before Memorial Day on Main Street. Held in Carnegie Park. Date varies. Saturday before Halloween on East Main Street Bridge. 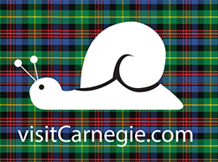 Saturday following Thanksgiving at the Andrew Carnegie Free Library. Friday following Thanksgiving in Downtown Carnegie.